Posted in Education and Preservation. Jangchup Lamrim teaching event, December 2013, Sera Je Monastery. Lama Zopa Rinpoche can be seen with his teacher, the late Choden Rinpoche in the fourth row of this photo. 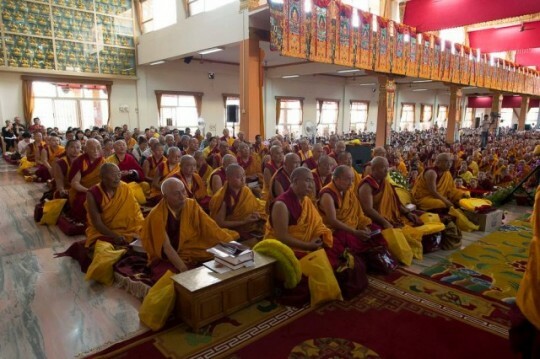 Lama Zopa Rinpoche has explained, “Making offerings to the Sangha is a way of collecting unbelievable merit because all the sangha are the pores of the guru. They are all disciples of the same guru – His Holiness the Dalai Lama. By offering to pores of the guru one collects more merit than offering to Buddha, Dharma, Sangha, as well as numberless statues, stupas.” 17,000 students of His Holiness the Dalai Lama will be offered food during a three day teaching event at Tashi Lhunpo Monastery this December. His Holiness the Dalai Lama with Lama Zopa Rinpoche during the 2014 Jangchup Lamrim teaching event, South India. Photo by OHHDL. Please rejoice in this offering of food to more than 17,000 pores of the guru. 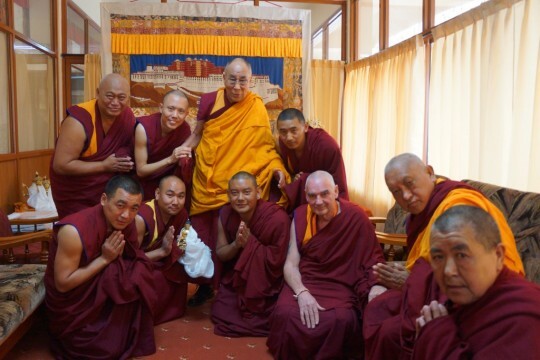 You can learn more about the Preserving the Lineage Fund and how it has supported His Holiness the Dalai Lama’s Jangchup Lamrim teaching event in previous years.